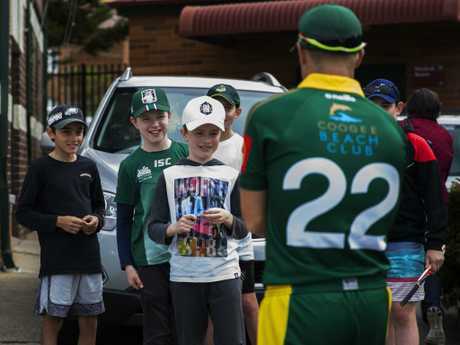 MOVING sightscreens, joking with photographers, mingling with locals - and yes, scoring a century - this was a surreal but special day for David Warner. 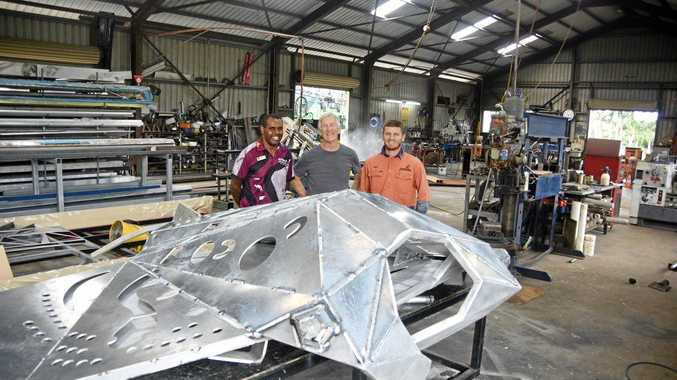 The former Test opener may have once been accustomed to the intense scrutiny of the international arena, but on Saturday in front of a modest crowd at his local cricket ground, he returned to his roots. 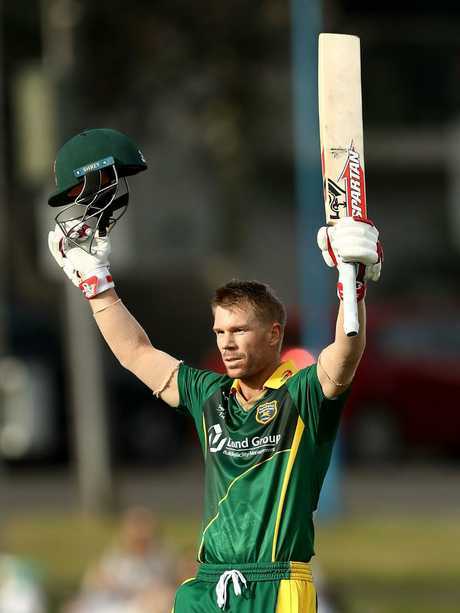 Warner stepped onto Coogee Oval to once again play for his Sydney grade cricket club Randwick-Petersham. It was a return he had to make to continue playing competitive cricket during his 12-month ball-tampering suspension. But as he signed autographs, posed for photos with kids and strode out to the middle to cries of "c'mon Davey" from youngsters, the reason he was there in the first place became hard to remember. 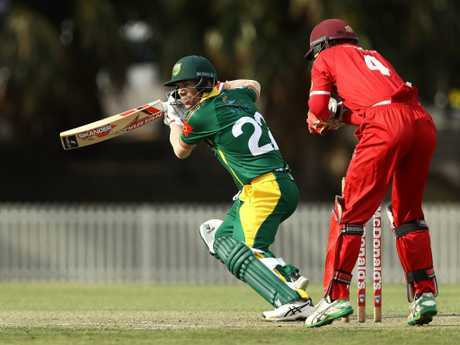 He then treated the crowd to a batting showcase from the David Warner the public once knew and loved. Based on the scenes in Coogee on Saturday, they still do. 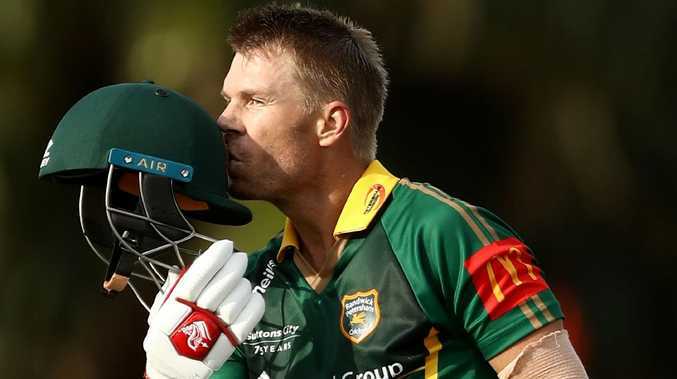 Confident, powerful and in control, Warner was clearly a class above the competition, as many expected he would be. David Warner signs autographs for young fans. After comfortably seeing off the opening pair - Test players Josh Hazlewood and Trent Copeland - he set about chasing down St George's total of 6-277. He truly announced his arrival when he played a straight drive back over the bowler's head and out to the Coogee streets in the 10th over. But this wasn't just an innings of mindless power. Warner continuously picked gaps in the field, rotated the strike and waited for a loose delivery. He treated the St George attack with total "respect", one of the three words emblazoned on the Randwick-Petersham club rooms. The others are "trust" and "humility". Then came his shining moment. Warner brought up his century with a leg glance before jumping in the air and fist- pumping in trademark Warner style. He kissed his team's badge and raised the bat to wife Candice and his adoring daughters. This was a truly emotional century, one you sensed meant more to him than one at the MCG on Boxing Day.